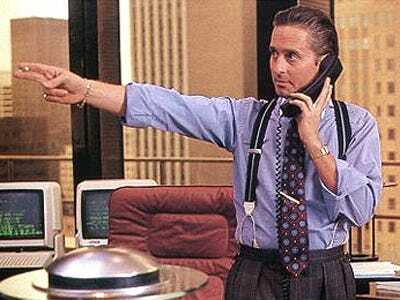 Busted Insider-Traders Talked In Code Like Bud Fox In Wall Street: "Blue Horseshoe!" "Frequent Flier Miles!" Blue horseshoe loves ya, babe. I’ll talk at you. Two recently accused insider traders used special codewords when communicating with each other, just like Bud Fox in the movie. This was presumably smarter than NOT using code words and instead going on in emails about trading on inside information. While the sequel to “Wall Street” will finally hit theatres in a few months, it appears other elements of the movie — like the catchy “Blue Horseshoe Loves Anacott Steel” phrase used to abet insider trading — haven’t gone away. Federal prosecutors on Wednesday arrested two men, one a UBS investment banker, in connection with an insider trading scheme that purportedly earned about $870,000 in profits… The amount may pale in comparison to other recent insider trading cases, but the two men, Igor Poteroba and Alexei P. Koval, used amusingly cryptic messages to communicate with each other, including discussions of frequent-flyer miles and wedding registries at Macy’s.